I first want to thank my friend, Melaine from My Sweet Savannah for hosting the chic french linen market tote giveaway for me. Also I want to thank all of you for participating in the giveaway and for all of your sweet comments you left over there. I hope you don't mind if I share product pictures with you from time to time. 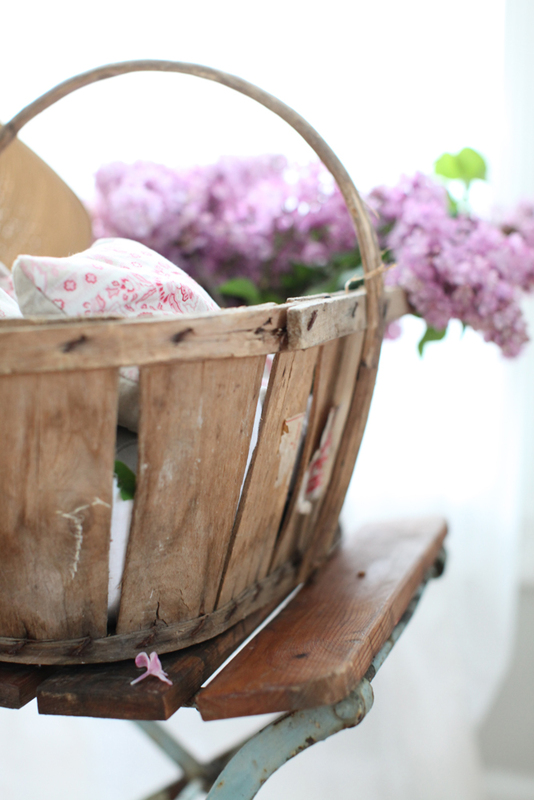 I first started out by adding a jar filled with lilacs to the basket, that ended up not looking quite right. I think the white tote helps break up all the wood that is in the picture. I like how the material looks against the wood and next to the lilacs. I love creating displays on my bistro chairs. Bistro chairs also make great night stands and or end tables. I wanted to introduce you to the talented Ruby Wand. Ruby recently special ordered a french ticking duvet and a set of french ticking euro-shams from us. My sister Liz designed and sewed the duvet for Ruby. I actually didn't get to see the duvet in person, since my sister lives in Atlanta, GA. I could hardly wait to share these pictures of her bedroom and the duvet with all of you. I love Ruby's style.... I think she is very talented. Ruby used to live in a 1900's white cottage. They had to move due to her husband's work and currently rent a condo. I just love what Ruby has done to this condo. Ruby's husband Russ, made the night stand and the bookcase. I love how Ruby used this mantle for a headboard and then added an antique bench to the foot of the bed. I also love how Ruby mixed so many white linens with her gray and white french ticking duvet. (The bottom side of the duvet is made from an antique french monogrammed linen sheet. Thank you Ruby for allowing me to share these pictures of your bedroom on my blog. I hope you will start a blog someday soon! Wonderful pictures....from the flowers and the bedroom! Gorgeous! 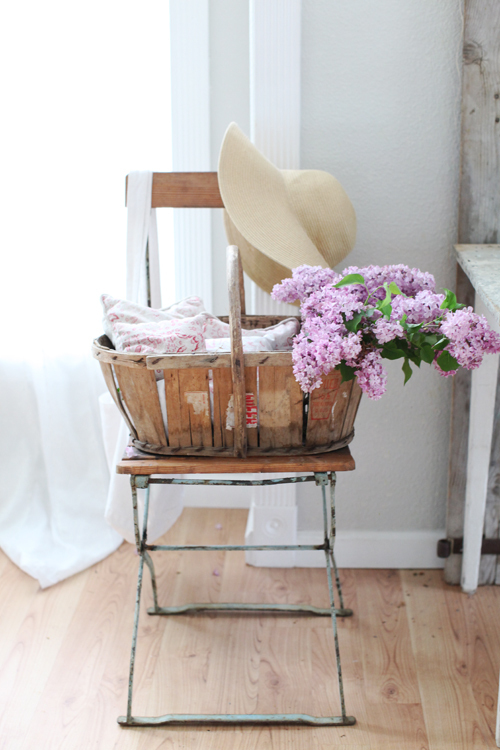 Love those beautiful lilacs and the photos, and also loved seeing Ruby's bedroom. I really struggle with the little vignettes like those, so it's really nice to see some examples and hear your process, too. Dear Maria, I love all your pictures and you don't need to say sorry for showing this perfect lilacs in them, I have never enough of lilacs! Your photographs and styling are divine!!!! Beautiful duvet and shams Maria..your sister is talented! the fragrance..I never tire of them.And Rubys bedroomis gorgeous..shes got style! Thank you for the step by step in how you created this pretty arrangement. It has so many natural elements and textures, just perfect. I love the duvet, what a great idea to use a sheet for the reverse side. The bedroom is just beautiful, too! Well let me say you succeeded! So beautifully done..has such a romantic, nostaligic and elegant feel to the home...well done!! I have some wonderful new bistro chairs, I just got from IKEA. I don't want to paint the wood, but boy do I now want to paint the metal. Dry brush maybe? Sand a little? Love it. Don't ever apoligize for using lilacs too much! LOVE em :) Great photos, your little bistro chair is so cute. Thanks for sharing your product pictures with us. Love how you achieved the look. Love Ruby's styling too. 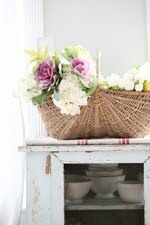 All of your photos are so dreamy, love the basket vingette on the bistro chair. I also love Ruby's bedroom. Your sister did a great job on the lovely linens. Thanks for sharing! Your pictures are beautiful. Our home still has the original paint...a minty green that I'm itching to paint white!! I often browse through a salvage shop where I live that have pieces like Ruby's bed frame! Love it! I love all of your photos, and I lovwe to look at your products as well. I agree that their needs to be a mixture of hard and soft surfaces to balance out! The room you featured is beautiful and your sister does amazing work! Maria, the pictures are beautiful, you really capture a lovely view. I just absolutely adore those lavender sachets. The fabric is simply adorable! you are so lucky to have your lilacs already. mine have some big buds, but nothing yet. i will be on the lookout for bistro chairs this flea market season. love yours. ruby's bedroom is gorgeous. and all those books. i just want to snuggle in for the night and read. 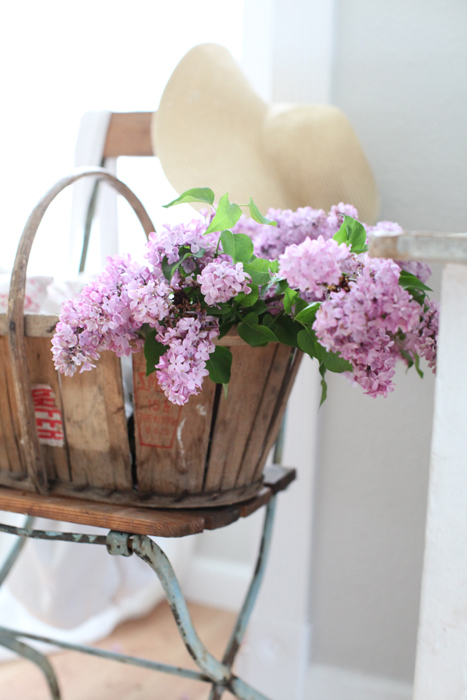 lovely lilacs... thank you for sharing! First of all...I can never get too much of lilacs...can't wait till mine bloom! Love the curved wooden handle on your French fruit basket. Ruby's bedroom is indeed beautiful...and I adore your sister's handiwork...the duvet with the linen sheet on the reverse is gorgeous! I love your duvet yo made for my sister Ruby. So talented. Love you shop Maria. Its like a little piece of eye cany everyday. Sorry for the typo errors :) I was typing way too fast. I love your old french fruit basket! And you're right, Ruby's bedroom is fantastic!!! I'm in love with her headboard, simply wonderful! Ruby's bedroom is gorgeous too ~ wow!! I love what your sister made and I love her bed ~ Sooooo gorgeous!! Everything you do, Maria, is simply beautiful! LOVE that French garden chair!!! Ruby's bedroom is wonderful - her new duvet cover is perfect for it! Omigosh...that bistro chair display is sooo perfect! And I love how it all looks so effortless. Totally charming from start to finish. Thanks for sharing your "magic" with us. It was nice to see your little photo staging process, Maria. I ADORE your bistro chair displays...and the chairs! I recently used a little wooden folding bistro chair as a nightstand next to my bed. I love it but am crossing my fingers that I bump into a weathered metal & wood chair...preferably French. ;) Ruby's bedroom is so pretty. The gray & white ticking is one of my favorite French fabrics and it looks absolutely gorgeous as a duvet. Your sister does beautiful work. I love how she closed off the ends with the seashells. Always an inspiring little visit here! Gorgeous photos, Maria! Thanks for sharing a bit more of the design process. Personally, I know my own style and I purchase/reuse items that reflect that style, but my weakness is definitely the design process: putting those items together and displaying them as a whole...I'd love to see more posts like this!!! Thanks for sharing your photo staging techniques Maria- you are truly talented in that area!! Ruby's bedroom is lovely. 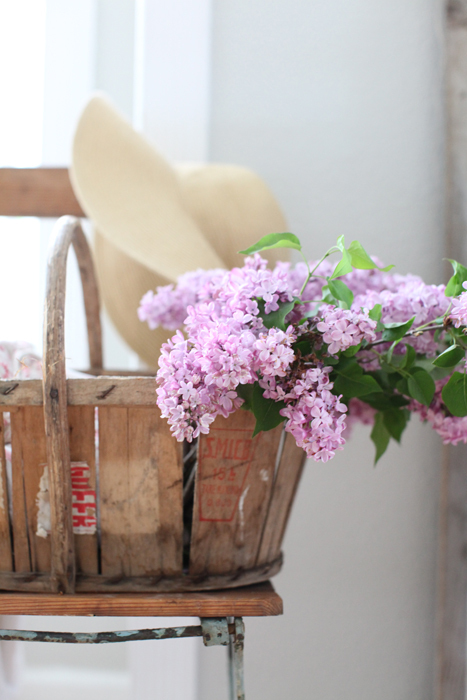 You created a beautiful vignettes with those lilacs and your hat, Maria! Your sister is so talented! Love Ruby's bedroom, she has some really lovely pieces there. this style is incredible, i love it!! 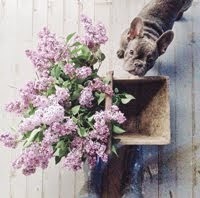 Gorgeous new product photos and so jealous that you have lilacs...my very favorite flower!! I bet your home smells amazing right now. You are fueling my passion for a bistro chair! It's okay, I still love you! ;-) I love Ruby's room, so fabulous...and in a condo, that lady has STYLE! gorgeous photos, and I absolutely love lilacs, so no chance of me getting tired of seeing them! :)I adore the duvet your sister made, it's absolutely fabulous!! She is super talented! What amazing, beautiful photos! 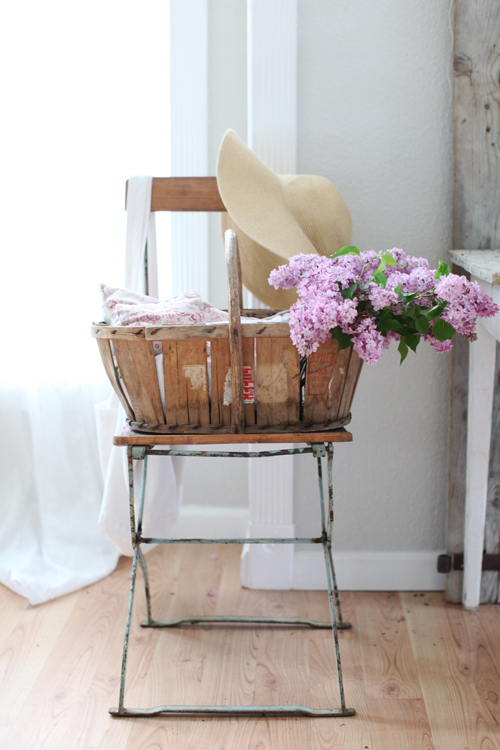 I love the heavenly lilacs in the basket. You are such an artist the way you set up your scenes and balance the color the texture and the composition. It's a delight to look at them. And,... Ruby's room is lovely... so calming and homey. The headboard and linens are fabulous! all of these pictures are gorgeous. i love whites. love them. i want my house to look like each of these pictures someday. 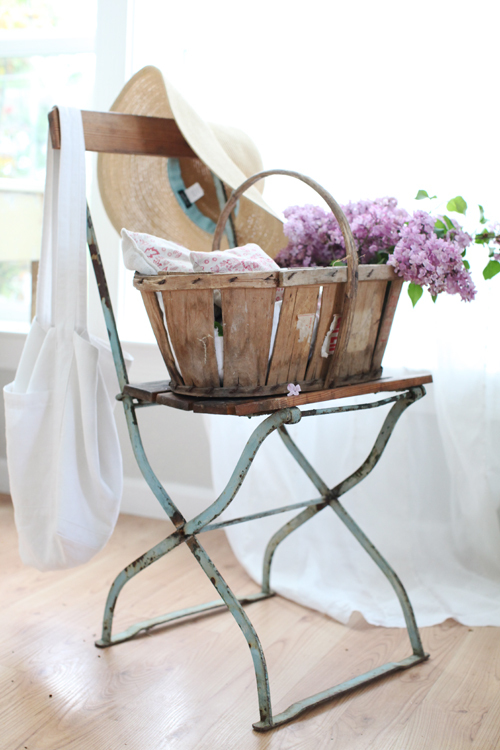 LOVE the lilacs- don't apologize:) LOVE the bedroom- gives me hope for mine! Thanks for all the inspiration!! Can you give me some ideas on where to find these fabulous things- like the mantel headboard, etc.? i almost fell off my chair when i saw that headboad all chippy and glorious!!!! It's a beautiful duvet, I love the flexibility of it being "reversible"!! ;-) Your sister is so talented. Does she have a blog? Does she make/sew for a living? The basket is beautiful. I want one!! The bedroom is lovely, shabby-chic! Love the cats too. I love the bed with the mantal!! the photos are beautiful! I love ALL of your cool bistro chairs - they are fantastic! I think the picture of the linens on the chair is my favorite of your posts but honestly all of your photos are always stunning. Have a great weekend! Congratulations to the winner! 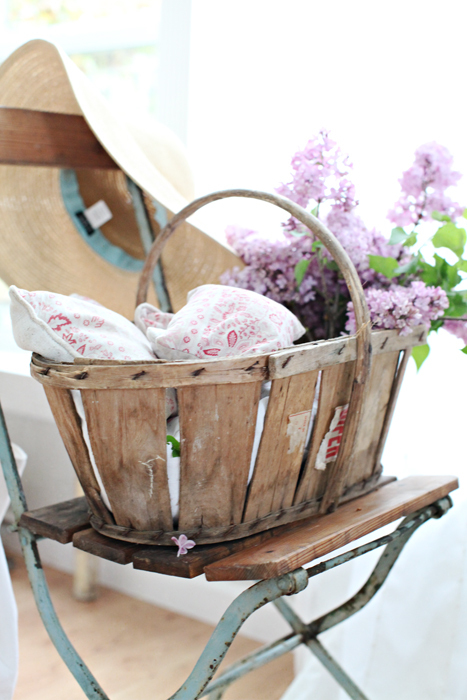 Maria, your photos of the French fruit basket and lilacs are gorgeous! So so beautiful. You are very talented. Ruby's bedroom is lovely and so is that duvet and the pillows your sister made. Ruby has done a wonderful job creating such a relaxing and cozy space. Love that bench she has at the foot of her bed. Have a nice weekend! You not only have a good taste in interior design but you're also good in photography. It's nice to came across blogs like this. Seeing pictures like this tells us how beautiful life is. 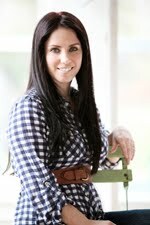 "Vacuum Cleaners | canister vacuum"
Hi Maria...you definitely achieved the relaxed farmhouse look ~ your photos are beautiful! Congrats to the winner and thanks for sharing those wonderful bedroom photos! Great pictures. Love the lilacs. You might want to remove the tag from the inside of your hat you use in the props it's a little distracting. Sorry! Love it all though. Rubys home is wonderful!....Just shows we can do a lot anywhere! Thanks for sharing! & your photography is stunning. oh, comme j'aime ce délicieux bouquet au chapeau... Dans mon jardin aussi le lilas est en fleur, mais tout blanc. oh silly girl, we love your pictures! And never too many with lilacs, they are only here for days....and worth every bit of waiting! Love the style, and your lighting is always just so perfect. I know what you mean about tweaking & trying to make a picture display just what you want. duvet is indeed lovely & dreamy. 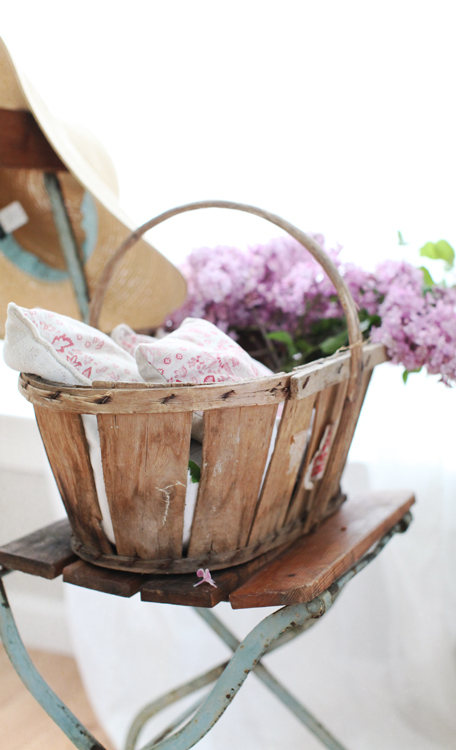 How wonderful Nancy of Fete et Fleur won the giveaway. There's not a nicer lady around. Way to go, Nancy! I just love your photos, Maria! beautiful.. love the whole combonation! Lovely pics! I really enjoy visiting your blog! maria, I loved this post of you telling how you came to compose this photo. so sweet, i love how it looks. lilacs are a fav of mine too. Ruby's bedding looks great. Loved the serenity of it. I need to plant some lilacs. Their fragrance and simple beauty inspire. I have a white variety but it doesn't seem to well in my area. I need to learn more about them. Thank you Maria for sharing these beautiful images. ruby's room and the bedding your sister made is stunning! i would love for you to visit my guest post over at annette tatum's blog. i think you'll like it very much! What beautiful photos!! !Thanks for sharing your tips. You take beautiful photographs inspiring me. I love the bench at the end of Ruby's bed. And I LOVE LOVE LOVE LOVE the headboard on Ruby's bed! Ruby's room, deliciously inviting and chic! breathtaking room that Ruby has...thanks for showing us pics of it.